It's easy and breezy in today's post. I don't know if I ever said it on my blog before, but my hands never match. It's a game I've been playing for the last 3 or 4 years. Sometimes the girls coordinate, but they don't call each other up to dish on which polishes they're taking out for the day. When they do coordinate or dare to wear the same undies it's a minor miracle. While I was doing my monarch mani the other day I inadvertently I painted both hands with China Glaze Custom Kicks. I blame the color because I looked down and bam! Matching claws. What's a girl to do? I didn't want to waste it so I decided to add some cute details to spice things up a bit. 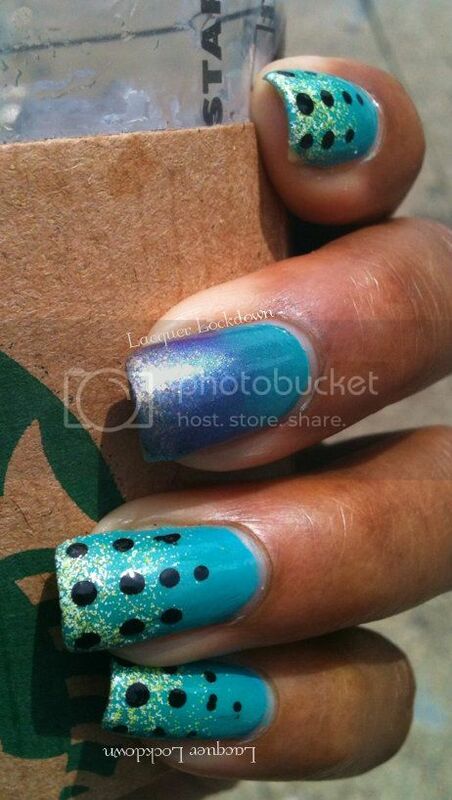 I like the effect of the matte glitter underneath the dots. Featured drink was a Passionfruit iced tea, yum! I used Pixels by Nail Potions/Kunimitsu to sponge on a glitter gradient. 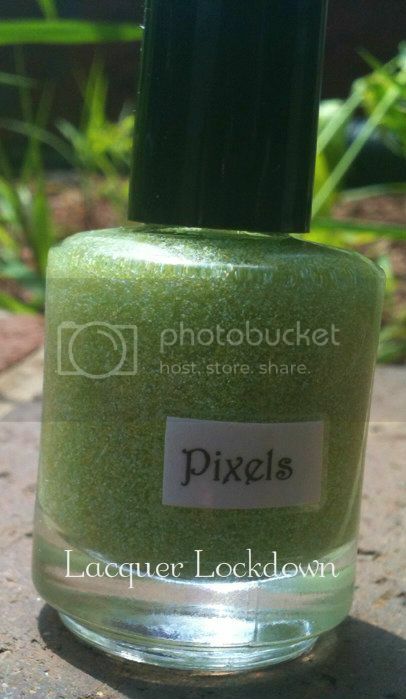 Pixels is a polish composed of small yellow, white, and light green matte glitter that applies like a dream. You can see all the soft little matte glitters floating around inside Pixels. This is a really beautiful polish! It took about two passes of the sponge to cover my tips entirely along with a thick coat of Poshe to smooth it out. 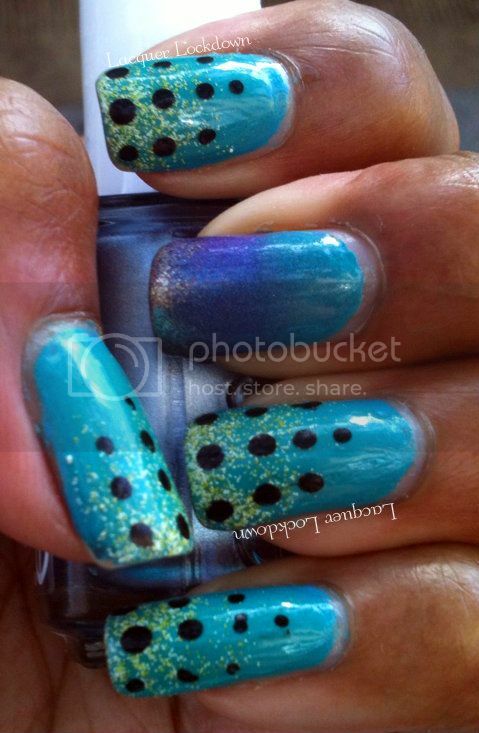 Then I used a dotting tool and Sally Hansen's Pat On Black to create a series of dots creeping up the nail. Heaven preserve me from photographing my dominant hand. It is SO much harder than I would have thought! The gradient you see is the same one I did in the monarch look using Custom Kicks, Grape Going, and Number One Nemesis. What do you think? I have to say I'm really liking matte glitters more and more these days. Do you ladies have any favorites to recommend? I don't have any of the highly coveted Nailadventurous ones, but I'd surely love too! If your interested in Pixels or any other pretties by Nail Potions check out her store on Etsy. Jessica is a doll face and has amazing polishes so you won't be disappointed. Song Stuck In My Head: Is It The Way You Love Me by Jill Scott. This song is my jam! First of all Jill Scott is my homegirl - I love her voice and her smokey jazzy style. You can't NOT groove to anything she sings qnd this one is just so funky. Every time I hear it I want to dance and sing. It's an instant mood lift. Thanks for reading and I'll see you next post!